Ah, The Evil Dead. I have such a soft spot in my heart for you. You’re a very special little film. The single best example of low-budget horror to date. The premise is nice and simple. 5 college kids including Ash (Bruce Campbell), his girlfriend Linda (Betsy Baker), Ash’s sister Cheryl (Ellen Sandweiss), Scott (Hal Delrich) and Shelly (Sarah York) head into the remote Tennessee woods, to spend the weekend at a rundown cabin. At this cabin they encounter all manner of creepiness until Scott and Ash find a disturbing book in the cellar, containing strange hieroglyphics and images of frightening creatures. They also find a reel to reel tape recorder. Upon playing it back, they find themselves listening to the recordings of a professor who was studying the book they found. The professor, making a horrible confession of what has transpired in the very same cabin and surrounding woods. He has translated the writings in the book and upon them being repeated, the kids unknowingly release an evil force from their ancient slumber upon themselves. What follows is a night of absolute terror. I was first introduced to this film a little over 10 years ago, when I was 14. A little older than your average kid who stumbles across this film, but still pretty young, none-the-less. I owe my love of underground, B grade and shlocky cult flicks to my good mate and fellow reviewer here on implusegamer.com, Mark Beresford. It was him who turned me in this direction and I just want to thank him for doing it and corrupting me for the better all those years ago. I remember on that first viewing how I originally felt about it. It was a scary film. I mean sh*t scary! It’s gory to the max and it’s pretty damn gross as well, but my god, is it original! Sam Raimi’s first full length feature film is incredibly ambitious to say the least and a lot of this ambition is pulled off and the time, effort and love put into making this film what it is, is obvious in the final product. Raimi has done things in this film that have been copied in other films time and time again since its first release and it’s easy to see why. The Evil Dead reeks of creative awesomeness! From Raimi’s creative camera work which is a marvel itself, to the originality in the story and the use of music and creative sound spliced with the film is all top knotch. 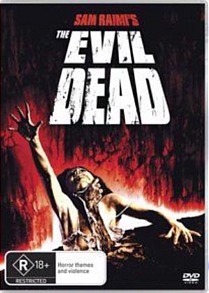 The Evil Dead also saw the feature film debut of B movie icon and all around man-god Bruce Campbell! Campbell, obviously inexperienced in acting does a great job as Ash, the man destined to go down taking on the many hordes of Deadites. Campbell plays Ash as a bit of a wimp in this first installment and it’s not till later in the sequels that Ash gains his trademark style, quips and looks, equipped with a wrist mounted chainsaw to boot! The Evil Dead is straight up horror, so there isn’t a lot of room for him to inject the series now famous over-the-top, cartoony style. He does an excellent job at playing a horrified guy, but he’s not against hardening up and hack up the possessed love of his life to pieces with an axe. Spare her the agony, of course. The Evil Dead has some small problems, but they add to the experience and can be overlooked. Why? Because it’s The Evil Dead! An inexperienced acting cast. Doesn’t matter, because it’s The Evil Dead! Overacted drama up the billy-o. Doesn’t matter, because it’s The Evil Dead! Makeup effects that aren’t totally up to scratch because of budget restrictions. Doesn’t matter, because it’s The Evil Dead! People will always find some sort of problem with this film that will have them whinging, but it doesn’t matter, because it’s The Evil Dead! The picture is great, the best quality image we are going to get on standard DVD, but it’s one of those films that, as good as the picture is remastered and as sharp as it looks, it’s never going to be better than a grainy old VHS copy! That’s right, this film deserves to be seen on VHS! It just makes it so much more nastier! I still own my VHS copy and will never part with it! Now let’s talk about the discs extras! The single best extra and one of the main reasons to pick up this newest release is for the new audio commentary by Sam Raimi, Robe Tapert and Bruce Campbell recorded in December 2009. Other extras include a great new doco entitled: One By One We Will Take You - The Untold Saga of The Evil Dead , Treasures from the cutting room floor, At the drive-in, Discovering Evil Dead, Make-up test, Ellen and drama teacher and On-stage interview. Well, what more can we say about The Evil Dead? It’s a film that has endeared and isn’t going away and I hope it never does. It’s a film that is so beloved the world over and an absolute master of the horror genre. Love it or hate it, The Evil Dead isn’t going anywhere anytime soon.